This is a rectangular Adanac Ginger Ale porcelain sign. 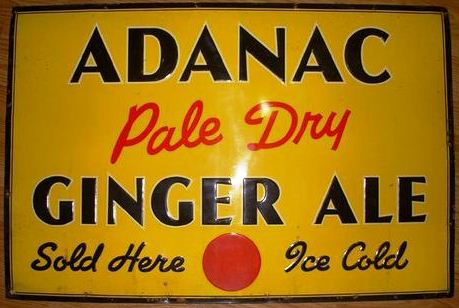 This particular Adanac Ginger Ale sign is predominantly yellow with black and red text. It reads, “Adanac Pale Dry Ginger Ale Sold Here, Ice Cold” and features a red circle at the bottom of the sign.